A truck vs. car accident or any other smaller vehicle can be devastating in terms of injuries or even death as well as property damage. Blind spots: The area where the driver cannot see other vehicles is called "No Man's Land." Because of the size of a tractor-trailer, there are many blind spots where the truck may collide with other vehicles when changing lanes. Head on: Head-on collisions with trucks are even more deadly than with another car because of the sheer size and weight of the larger vehicle. Jackknife: When the trailer portion skids out and ends up at an angle to the tractor, the truck can sweep across several lanes of traffic. These are usually caused by hard braking. Read more in our blog on Jackknifed Tractor Trailer Accidents. Lost load: Falling cargo that has not been properly secured or loaded poses significant dangers to adjacent or following vehicles. Rear-end collisions: Heavy trucks require greater braking distances. 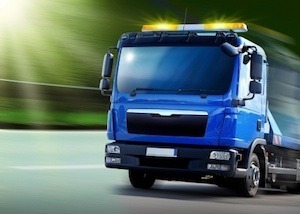 Considerable damage may occur when a truck hits the rear end of another vehicle. It takes 426 feet - almost one and one-half football fields - for an 80,000-pound truck going 60 mph to stop! Rollovers: The truck slides when out of control of the driver and rolls onto its side. These can be caused by speeding, going down steep inclines or taking a curve too fast. T-bone: When any vehicle including a truck hits another vehicle's side, the accident is called a T-bone because of its shape. Tire blowout: Although a blown tire can happen with any type vehicle, in a truck it could cause the driver to lose control of the truck. Underride: If a vehicle is following a truck too closely or the truck stops quickly, the following vehicle can be jammed under the taller rear-end of the trailer. These crashes are some of the most dangerous and deadly truck accidents. Wide turn: If the driver swings to the left to make a right turn, the truck can hit vehicles on its right if they move into the zone between the truck and the sidewalk. Respect truck drivers. They have a job to do. Give them plenty of room and never cut them off or pull ahead of them abruptly. Drive ahead of or behind a truck at a safe distance to allow room for braking. Stay out of the truck's blind spots or "No Man's Land." Be courteous - safely move to the left to allow a truck to enter the highway. If you or a family member has been injured in a truck or car accident or any other type of personal injury, please contact the Law Offices of Diana Santa Maria, P.A. immediately. Our experienced attorneys will fight for the compensation you deserve. Please call us for a free consultation. Attorneys Diana Santa Maria and Laura D. Dolin, personal injury attorneys in Fort Lauderdale, will fight to secure justice for you and your family. You can reach us at (954) 434-1077 or contact us via the website.